1. Sift the buckwheat flour into a bowl, add the ground flax seed and the salt. 2. Blend the banana with the oat milk and water on high power for 30 seconds. 3. Pour this mix into the dry ingredients and beat it well until it's smooth and a little aerated. Leave this to sit for half an hour covered at room temperature. 4. Get a good non stick frying pan hot and drizzle the oil over to cover the base of pan, pour in the batter to make slightly thick pancakes with a small diameter. 5. When the edges start to brown and the batter in the mid- dle is just set flip over and finish the other side for 30 more seconds, repeat until you have a stack worthy of your appetite. 6. 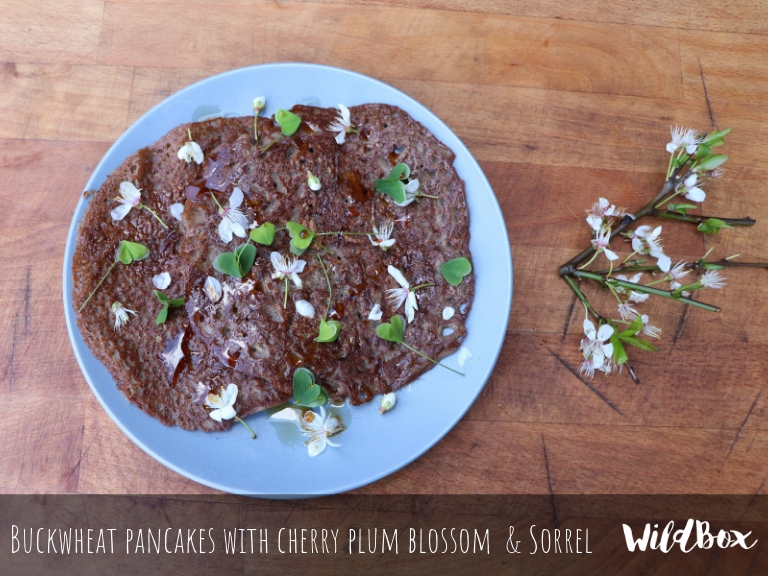 Drizzle over the mapel syrup liberally and scatter the blossoms and pale pink sorrel leaves over just before serving.